One thing that had always worried me (before I got a wood stove) was the regular blackouts that happen here in the Northeast and not being able to heat my home. Up until the time I got the wood stove, I was able to figure out a method that easily met my needs in an emergency. In this article, I want to share with you this low-cost method that can be used whether you live in an apartment, a rental home or your own home and don’t have the option of some of the other more permanent off-grid heating options such as wood/coal or solar heating. A couple years back, I had purchased the Mr. Heater Big Buddy portable propane stove (you may have seen the review here) and since that review I’ve had two instances where the power went out for a day or two forcing me to use it (in combination with the method I’ll be sharing next) to keep us toasty warm. Note: this technique is particularly appropriate if you live in a place larger than 500 square feet. If your home/apartment is 500 sq feet or less, then the Big Buddy will be just fine by itself. In terms of heating your home in an emergency, you need to start thinking of actually heating a smaller, cordoned off area where it is a lot more economical instead of feeling you need to heat the entire home. For emergencies, the thing you want to do is basically cordon off a room or dedicated area in your home that will become your heating and living space for your daily activities. For my home, we used the living room for this purpose. 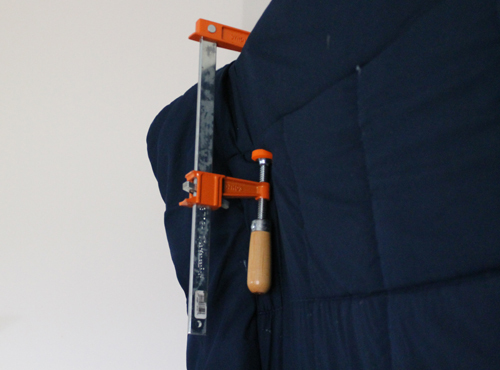 Some things that you can use as partitions are a large thick blanket, a plastic tarp, even a large mattress that is big enough to shut off and partition a section of your home. Then, using a portable heater that can be used indoors (like the Big Buddy), heat that room exclusively and use that room for your daily activities (and possible sleep area). 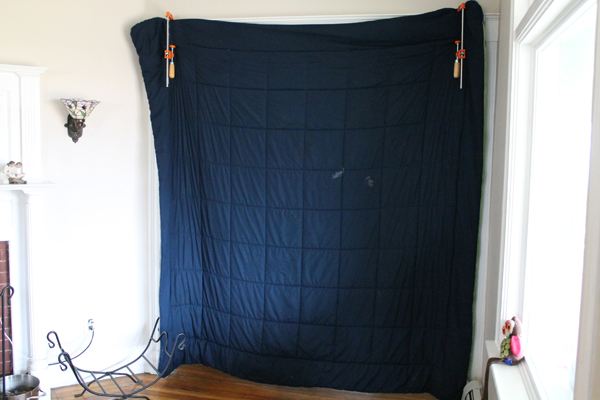 Since the Big Buddy is portable, we were able to bring the heater into our bedroom (as well as the kids) and with a window cracked a small amount, heat the room while sleeping. 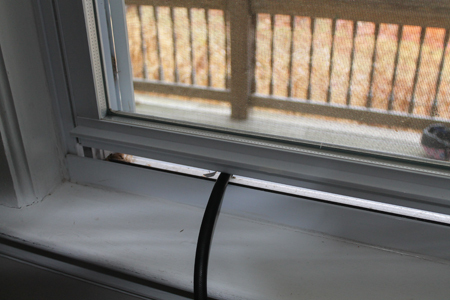 If the crack in your window is too large for your liking and it’s venting too much cold air, stuffing a bit of insulation (old t-shirts, foam, or commercial insulation) will cut down the amount of cold air drafting in. Note: The heater does have a low O2 sensor that automatically shuts off the heater if oxygen reaches a low enough point where carbon monoxide starts to be produced but I like to err on the side of caution. Well, in a 450 sq foot living room, with the temperature into the teens outside, I was able to keep my room at a comfortable temp around 70°F with the heater running at medium (turning it to low or off if the temp rose during the day). With my two 20 lb propane tanks, I had enough fuel to last me around 2 weeks with regular use. As always, I’d love to hear your comments. 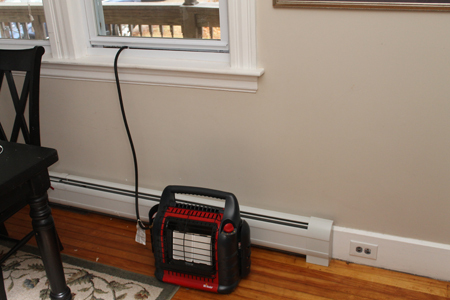 Let me know what ways you use to heat your home in the winter that doesn’t depend on the grid. I’m not sure I understand the question. Do you mean besides the Big Buddy heater I mentioned above? If by no gas, you mean no fuel (propane, kerosene, etc) then you’re left with wood (or other biofuel) and building a rocket mass heater is a great option for you if you’re handy. Just look up “rocket mass heater” and you can find some examples of what I’m talking about. Thanks! I’ve been trying to decide is spending the money for the adapters for my Big Buddy was a good idea. Guess it is! I like this set up. Thanks for sharing. Great info and good, easy to understand, instructions and pictures. Hey Mike: Does using kerosene violate your “no gas” parameters? If not, look into portable kerosene heaters. I saw one at Home Depot a few weeks ago, it sold for less than $150 and claimed go heat over 1000 square foot area which is almost twice what the buddy heater does. 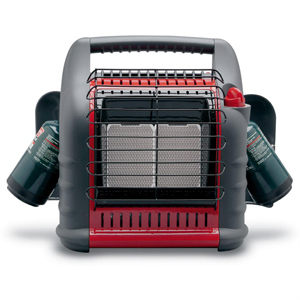 I also have the buddy heater, I have never used it in my house but I do use it camping. Even though I have a wood stove I want to get the kerosene heater for my basement. Last year I bought a Mr. Heater Buddy. I thought it was going to be a disappointment. It wasn’t! I stocked up on small camping bottles until I discovered the hose that attaches to bulk bottles…which I just bought. Next purchase will be 20 or 25-lb bottles. Sportsman’s Guide has the device which will allow you to fill a 1-lb bottle from a bulk bottle. Hello Mike, Good Morning, first hope you have a great Thanksgiving. My name is Mark retired from the Military, wanted to toss something out here on the Internet concerning home heating. WE NEED TO BE ON GUARD, Why. Our ever so helpful government has decided that your wood burning stove is now a danger to the world. In another attempt to outlaw the off grid lifestyle, the Environmental Protection Agency (EPA), the same agency that was recently caught using drones to spy on Americans, is now going after home owners who use Wood Burning Stoves to heat their homes. One thing NO ONE TALKS ABOUT is that e very day Volcanoes, throw things in the atmosphere,and each day is more than man has burned or started in the life history of mankind. Forest fires do more damage than man could. Lets fine the trees. Seems stupid people sit on their duffs coming up with new ways to stop everyone from being able to live a life style of their choice. We lost our furnace for 3 days last winter and used a “little Buddy” [the smaller version of this one] to heat two rooms in our house [about 700 sq ft, 6000cu ft] to 60-70 degrees. We didn’t run it continuously and we turned it off at bedtime just in case [11pm – 6am]. It got down to about 45-50 degrees by morning, but the rooms warmed back up in about 1/2 hour. It used one camping tank a day, so I can easily believe that a 20lb tank lasted for a week and possibly two. The temperature outside varied from as high as 35 degrees to as low as 20 those days, but the room was well insulated with blankets over the windows and doors [plus the body heat of my wife, two dogs and myself]. The above advice of getting a separate CO detector is a great idea – with that I’d leave it running on low most of the night. Thanks uncus. Yeah, each 20 lb tank should last a week with regular (not constant) use. Good article. Terra Cotta pots and candles will work. It will take a lot more around the house to keep it warm. Great product for emergency! Also, some handy folks can look at making a solar heater. The solar heater works, but depending on materials that it is built with can be smelly. Personally, we have a wood stove as well as a gas fired fireplace with doors. We also bt the buddy heater as a back up. 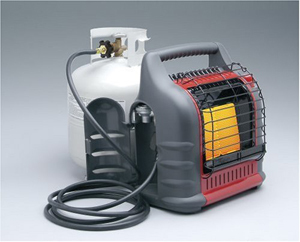 For most who don’t know, propane and kerosene can be used indoors with appropriate cautions. BUT< natural gas or wood or charcoal can kill if used indoors. The idea for creating a warm room is an awesome idea. We lost all utilities in a recent ice storm last year. We used propane to cook indoors and noticed that with caution and supply discipline, we heated our eating and cooking area just with the cooking appliances. I believe warmth for my family is more important than air conditioning after a storm in the summer. Great article. I purchased my Big Buddy a couple of years ago with the 20 pound extension hose and thankfully have never had to use it outside of a practice run. I will say that it kept my family warm for the entire weekend we used it, and like your example it did not use much propane. another thought on keeping the heat going at night or after you turn off your big buddy, is by placing a “mass” of any dense material next to the Big Buddy while it is on, this will not only heat up the ambient air in the room but also the “mass”. I have seen some people use large water containers or piles of stones when in the field, the advantage here is that once the “items” are heated up they will continue to give off stored up heat much like that of a solar heater. This technique will also work during the day by placing a “mass” next to sunlight coming into a southern facing window and allowing it to absorb the heat during the day and slowly releasing it during the night. There are some who are now going as far as building internal stone walls next to southern facing windows to help absorb heat during sunny days that would normally be lost after sundown. 55 gallon steel drums painted flat black and filled with potable water and placed along a southern facing window will do the same thing. Some great tips Jim! Funny you mention the passive solar heating. I’ve been looking to build something for my home next year and am doing some research as to what are my best options. Thanks again! i am moving into an apt in december, the whole building is all electric. lights of course but also water heater cooking and heat for the apt too. i plan on buying a kerosene heater. they are awesome not only for use in regular heating but they are more than fantastic in an emergency situation. you can pretty much figure a full tank of kerosene will last for 12hr or a little more depending on how high/hot you burn it. if you don’t have a camp stove you can also heat water and cook on top of a kerosene heater. i’ve done that many times. Very cool. Any kerosene heaters you recommend? I wouldn’t mind looking into one as another backup. When I was little, we had a big kerosene heater. (You know the ones that looked like a big bird cage with a heating coil inside) The winter I remember the clearest we’d moved into a new house in Florida… Surprisingly cold in the winter. Our hot room was the hallway, we were able to heat water for cocoa ontop of the heater and it actually got quite cozy. anytime, I hope you will do another article and show us what you have done. Thanks for the great link Marianne! That’s a great idea JS. Especially in conjunction with an off-grid cookstove to heat the water before you go to bed at night. Thanks! I wonder if adding a stack above the heater and surrounding it with paver bricks would help heat by 1) creating air circulation w the stack, and 2) having something hold the heat as a thermal mass? had power out age over last 3 days i changed brakers in box found 1 side of the box not working will be till after the 1 st till ele company can com out had to re route wires to run heat ,water sub pump and frige and frezzer found that the out side meeter was lose had to pull it out and clean termals re atach metter and it all came back on so just a thought it still could be a bad meeter yet you can move lines to power up brakers if in need !!! it kept the kids worm and as fare as extra water we had on hand it did help alot in the start of this 3 day event!!!! How about the Wave 8 heater? We got one for our son & he is using it here in Washington & really likes very good on propane, too. This one heats up to 23′ in our mobile which is 39′ so you would need another small one for the bedroom but he manages with this one so far…. BTU for 2 1/2 days on 20lb tank. Placed heater and tank in bathroom. All three rooms stayed about 68F with it about 32F outside. A very helpful heater. Checked on them twice a night and they all did fine with no headaches or anything. To read a good description of CO poisoning read Richard Byrd-Alone at the South Pole. Believe these units are very safe and useful. Could be a lifesaver in a major winter power outage.